Queen Composter shares how she preserves the bounty of the season for the long winter ahead. This is the time of year when the earth's bounty is overflowing. The harvest is in full swing and there is abundant fresh, local and often organically grown vegetables and fruit. Those of us who have kitchen gardens are faced with buckets full of tomatoes, beans, zucchinis, greens and herbs. If you don't have your own garden, it is easy to find local food at farmers markets and local farms. I am trying to bake as much zucchini bread as I can, but it is nice to have homegrown, or locally grown food in the winter months when most of our produce comes from far away. Climate Crusader has written of easy food preserving methods, and I would like to share my favourite way to preserve the summer bounty for the long, wet, cold winter. I enjoy eating my easy refrigerator pickles and beets, but I have yet to delve properly into the world of canning (it's on my "to learn" list every year). This would be my best bet for saving the majority of my harvest, but every year the complications of life seem to get between me and my canning dreams. My preferred method of food preservation, by default, is freezing my food. 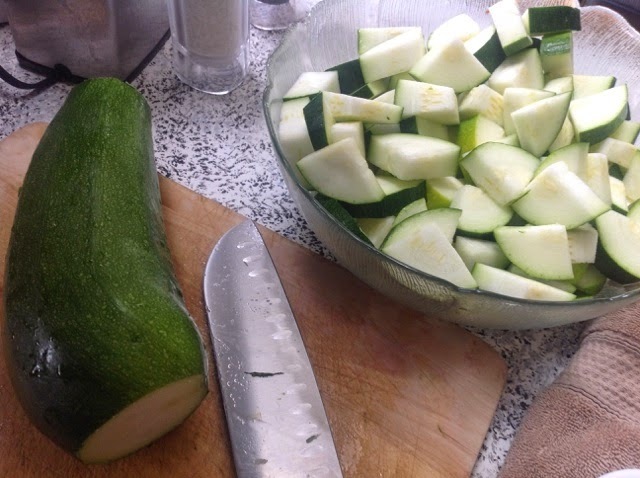 This past spring we used up the last of my frozen zucchini just as I was preparing to put the new zucchini plants into my garden bed. I have learned that it is possible to freeze many vegetables and berries, it just takes a little preparation and time to do it properly. I would be hard pressed to think of a meal that I cook that doesn't begin with garlic, and it is a basic staple that I must have on hand. I don't like buying non-organic garlic because pesticides can concentrate in the parts of plants that grow in the soil, as opposed to the parts of plants that we eat that grow above the soil. I also don't like the high cost, or quality, of organically grown garlic that is available in the winter months. 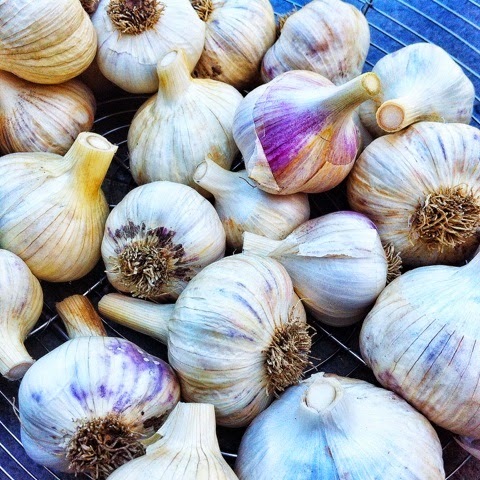 Ideally the best way to have organic garlic is to grow it yourself, as I enjoy doing (I want to be a garlic farmer when I grow up), but local garlic is abundant now as the harvest should be finished curing (drying out the garlic bulbs for storage and intensity of flavour). Check out your local farmers market or farms in your area for availability. Garlic can last for several months in a cool, dry location, but to get through the long winter I like to freeze some of my garlic. Chop the cloves into small pieces. I mince mine in a food processor. Add enough oil to the chopped garlic to cover it. I add olive oil to the garlic in the food processor and give it an extra pulse or two. Section the garlic and oil mixture into ice cube trays and freeze. 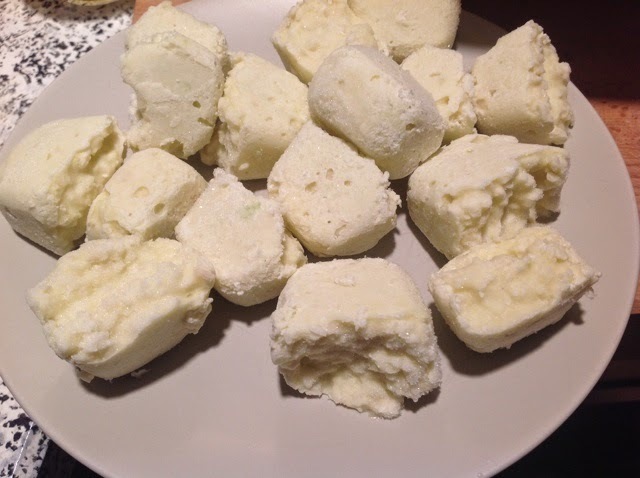 I try to make each cube be equal to what I would use in a typical meal for ease. When the cubes are frozen, pop them out of the ice tray and store in a freezer safe container. I will use a similar method for preserving my fresh herbs. I don't dry my herbs because I don't have a food dehydrator (in a mad downsizing phase I gave mine away and I've regretted it ever since) and I personally find the long method of hanging the herbs doesn't preserve the flavour as well. 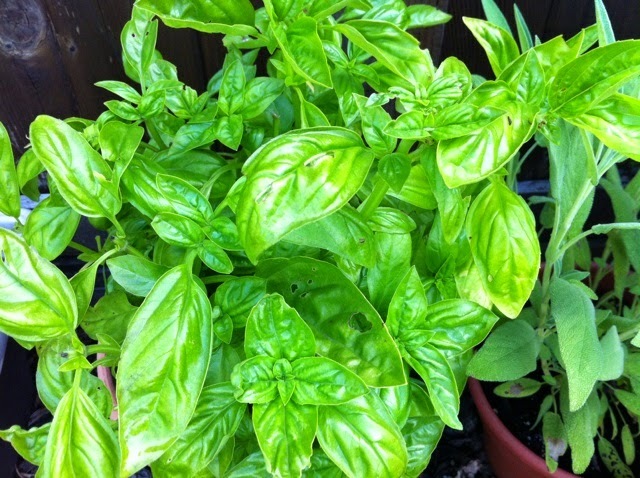 My basil is almost ready to bolt so I need to harvest it soon. Of course I will let some go to seed for seed saving. Clean and pat dry the herbs. Chop the herbs as finely as you desire. In a bowl mix the herbs with the oil of your choice (I use olive oil). Section the herb and oil mixture into an ice cube tray. Again, try to make each cube be equivalent to the amount you would want to season a meal. * I use the above method for pesto, which I often have huge amounts of earlier in the summer when I harvest my garlic scapes. If you have never tried garlic scapes, the flower stem of hard neck garlic, I highly recommend it. I prefer scape pesto to regular garlic pesto because it has a more mellow flavour than garlic clove pesto. If you have to buy a zucchini in the summer you don't have friends. I haven't resorted to the ding-dong-ditch method of giving away my zucchinis yet, but in previous years I have come close. While my zucchinis aren't as plentiful this year as in previous years, it has been a banner year for my beans and I have more than I am able to eat. For these and other vegetables it is easy to blanch them then freeze for a locavore winter meal. Wash and cut the vegetables into a desirable size. For example, I like wedges for my zucchinis. Bring water to a rolling boil. Immerse the vegetables in the boiling water. Leave in for a few minutes (check blanching times for various vegetables here). Remove and strain water from the vegetables. Immediately place vegetables in ice water to halt the cooking process. Pat the vegetables dry (to avoid freezer burn) and place on a baking sheet, ensuring the pieces are not touching (so that they do not freeze together into a block), and place in the freezer. When the vegetables are frozen, remove from the baking sheet and place in a freezer safe container. I have a bit of a kale addiction and always grow too much. It is an excellent cold weather crop and as a result I don't need to preserve kale until well into late fall. I wait until around the first few frosts and then harvest as much as I can and freeze it. Wash and completely dry the kale. Chop into very small pieces. I use a food processor. Lay the kale in a thin layer on a baking sheet and place in the freezer. If it has been done properly, the kale should should crumble easily once frozen. When it is frozen, place in a freezer safe container. My local area has numerous strawberry and blueberry farms and we like to buy large quantities at the end of the season when the berries aren't as pretty too look at but are more reasonable. I like using the frozen berries for baking or smoothies so less than perfect berries are ideal. Gently rinse the berries to remove any dirt and remove any stems.. Cut off any blemishes or bruises (from strawberries). 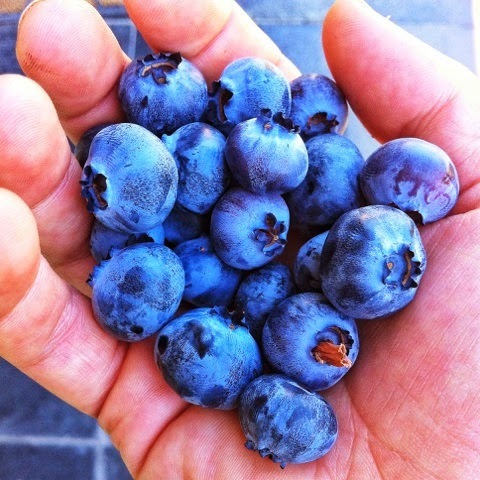 Place berries on a baking sheet, ensuring they do not touch (so that they do not freeze together into a block). Place the sheet in the freezer. When the berries are frozen, remove from the baking sheet and place in a freezer safe container. You want to be a garlic farmer when you grow up? You are too cute!!! I have to admit that I love the freezer for preserving stuff. I do can (water bath canning) but if I'm not sure if it is kosher to can, I just pop it in the freezer. Thanks for all the tips. I need to try to herbs one! Thanks Green Bean. I think you should do a post on your roasted tomatoes! I'm buying a bunch of tomatoes (mine are so slow ripening, and those that I leave on too long are getting eaten by raccoons) from the farmers market tomorrow and trying it. @Christy - I had to buy my tomatoes too. The dang squirrels keep getting mine! Plus, we've had a cool summer and everything seems to be taking a long time to get going. Great post - freezer is my favorite way to preserve too, cause I Don't know how to can. Best way to freeze tomatoes, anyone???? ?